Hey guys. I just wanted to give you a quick update on my Ashermans Journey. As you know it has been a little over 2 weeks since my hysteroscopy. I am feeling great and hopeful for our future. I had been doing my Castor Oil Packs for a few days but then I started to bleed. My DR and I aren't sure if this is my period, or just bleeding for surgery. You are not supposed to do the packs during menstruation so I am starting these back up this week. I am very hopeful this was my period. It has been over 2 years since my last real period. I know, years ago I would have never been happy about this, but now it is a blessing! The scarring of my cervix prevented the blood from draining. This caused severe pain. I went for a follow up appointment yesterday and the DR thinks the scarring has stayed away. Here comes the TMI. I had a cervical probe and they were able to insert the probe 7cm. They are not sure if this was fully through my cervix as this was a blind procedure, but she feels it was far enough to feel confident about the results. The Dr gave us the all clear to start trying for little baby #2. 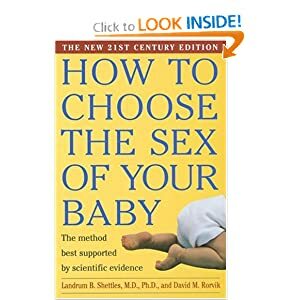 I bought this book when we decided to have Eliza, we wanted to try our hardest to ensure we had a girl. It could be genetics, it could be luck, or a blessing, but we were given our girl. We are going to use these techniques again for baby 2. The book claims to have an 80% success rate when using their techniques. They have information on having a boy or a girl. Obviously, no matter a boy or girl we will be thrilled to have another child, especially after the trials we have gone through. Since my cycle is very wonky I decided to purchase ovulation kits. This is a big part of trying for a girl as well. So here is to hoping we get one of the greatest Christmas gifts of all, like we did in 2010!! So nice to read your story. I also have Ashermans Syndrome. Good luck on baby #2. We're trying to, but with a fertility Dr.